Help children learn about money or use play money to play in your casino night events or as apart of your decorations. Each pack of $1.00 novelty bills contains 250 $1.00 bills that are 6″ x 2 1/2″. 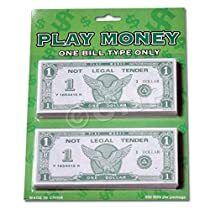 Our pack of 250 twenty dollar bills come on a blister card and is sold by the pack. Please order in increments of 1 pack.